This article contains some of the most romantic castle hotels in Scotland for memorable getaways and vacations. Some of these luxury Scottish castles offers a wide range of facilities and activities such as spa, sauna, pool, whirlpool, fitness center, landscaped gardens, hot tubs, great wedding venues, business services, reduced mobility facilities, tennis court, mountain biking, rafting, off road driving, winter activities, golf, horse riding, fishing, falconry packages and more. Castle Hotels in Scotland. Romantic Getaways & Vacations. Originally built for the Murrays of Blackbarony, and steeped in history, this imposing 16th century tower house has evolved into the modern, welcoming hotel we see today. Behind the impressive stone façade lies one of the greatest castle hotels in Scotland offering comfort to the most discerning guest. The welcoming bedrooms offer all home comforts. As the hotel is a castle, every room is unique and have differing views of the surrounding garden, woodland and glen. Some of the services and facilities are: Indoor heated pool, Fitness centre, Sauna, Spa, Whirlpool Bath, Heated Loungers, ESPA Treatment Rooms, Babysitting on request, High-speed internet, Business services, Bar and Lounge, Wheelchair access, Reduced mobility facilities and more. One of the best and most romantic castle hotels in Scotland for unforgettable getaways and vacations. Nestled among Scotland’s beautiful Borders countryside, Stobo Castle offers relaxation, pampering and rest. The guests can expect excellent service, fine food, knowledgeable, elegantly trained staff, and the hotel’s range of over 80 different face and body spa treatments provide everything your senses could desire. 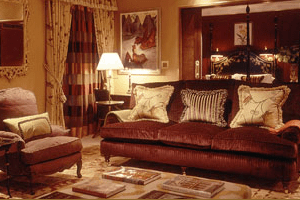 Stobo Castle offers a range of accommodation options from the Cashmere Suite to separate lodges for larger parties. A stunning range of twin, double and single rooms cater for every accommodation request. Some of the facilities are: a traditional dry heat Swedish Sauna, in the lobby of the pool area; outdoor hot tubs provide seating for guests to enjoy a soothing water jet massage whilst admiring the landscaped gardens; Crystal Steam Room within the pool area; one of the most advanced hydrospas of its kind; Ladies Health Suite; Aroma room; and more. Outdoor activities and facilities: beautiful grounds, Japanese Water Gardens; specially designed to promote a Zen-like calm; tennis court; a selection of mountain bikes are available, and more. One of the most romantic castle hotels in Scotland for a memorable wedding or romantic getaways, and vacations. Amhuinnsuidhe Castle is an unique venue and one of the finest sporting estates and most romantic castle hotels in Scotland. Along with its elegant public rooms and well-appointed bedrooms, the Castle is situated in a magnificent location. With amazing views to Taransay and the beaches of South Harris and the dramatic landscape forged from rock that is literally billions of years old, you are guaranteed an exhilarating and unforgettable experience. Amhuinnsuidhe Castle was designed in the Scottish Baronial style by the architect David Bryce and built in 1865 for Charles Murray, the 7th Earl of Dunmore. During your stay take time out to enjoy the sea views from the Drawing room, entertain friends and family in the Grand Hall, enjoy a few frames of snooker in the Billiard room or simply relax in the television lounge or library. All of the rooms are comfortably furnished and offer a warm and relaxing environment. Amhuinnsuidhe Castle has individually designed bedrooms many of which have original features, excellent views and provide a luxurious base for your stay. 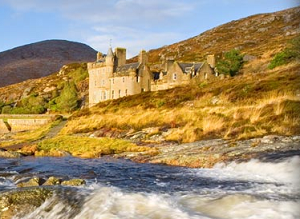 One of the best and most romantic castle hotels in Scotland. Inverlochy is Scotland’s finest hotel and restaurant uniquely located amongst the glens, lochs and mountains of the West Highlands of Scotland. Inverlochy was built in 1863 by the first Lord Abinger, near the site of the original 13th century fortress. Each of the 17 bedrooms, all with private bathroom, have their own individual design and character, along with splendid views of the grounds and surrounding mountains. Children are welcome at Inverlochy Castle and there are plenty of activities in and around the Castle to keep everyone amused: Billiard Room, Games Room, Playstation, Woodland walks, Boat trip on our loch, Baby Sitting Service and more. Wide range of activities: Whitewater Rafting, Mountain Biking, Off Road Driving, Winter Activities, A round of golf at Fort William Golf Course, Horse riding, and more. One of the most romantic castle hotels in Scotland. Former Scottish Baronial castle, Cringletie located near Peebles, and only 30 minutes south of Edinburgh, provides relaxing accommodation in beautiful bedrooms, one luxurious suite and a delightful cottage in the grounds, all individually designed, and all offering outstanding views over the gardens and Scottish countryside beyond. 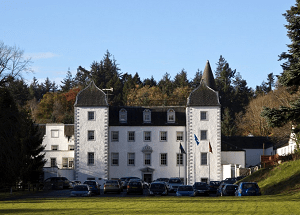 Complimentary WiFi is available throughout the hotel and this Scottish castle hotel offers a range of in-room spa treatments should you wish to indulge. The hotel is set in 28 acre grounds where guests can enjoy a woodland walk or a stroll through the beautiful walled gardens. The region boasts not only spectacular scenery but some of the best mountain biking in the UK at Glentress, fishing on the Tweed (Europe’s premier salmon fishing river), and some of the best field sports and golf in Scotland. The hotel welcomes children of all ages and can sleep up to 6 people in our Cottage, many other rooms can accommodate extra beds for little ones. 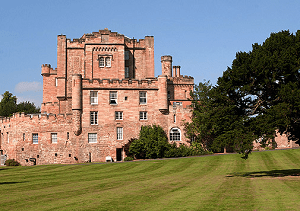 One of the greatest castle hotels in Scotland for romantic getaway and vacations. A magnificent 13th century fortress, just 8 miles from Edinburgh’s city centre. 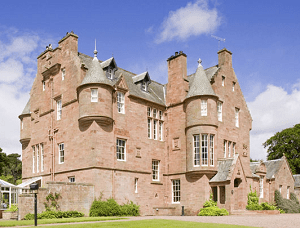 Set within acres of wooded parkland on the picturesque banks of the River Esk, Dalhousie Castle has luxurious surroundings, and the title as Scotland’s oldest inhabited castle. From the moment you arrive, you can expect a warm Scottish welcome and a truly memorable vacation in one of the greatest castle hotels in Scotland. The hotel offers a beautiful venue for relaxing breaks, city visits, weddings and conferences. You will find here Aqueous spa with indulgent bespoke beauty treatments. 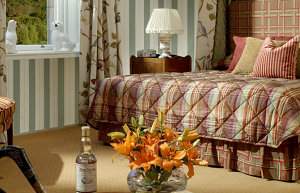 Within a rich tapestry of arts and culture Dalhousie Castle offers 29 beautiful bedrooms. These are decorated in Scottish design fabrics such as tweed, tartan and twill. A wide range of activities are available such as: fishing and a selection of exciting falconry packages within the Castle grounds . One of the memorable castle hotels in Scotland. See also castle hotels in Ireland and castle hotels near London.